Venerable Khenpo Kunsang Dechen Rinpoche was born in Tibet and studied in Namdrolling Monastery Monastic College Ngagyur Nyingma institute for complete nine years with top Honors. He has received countless teachings, transmissions and empowerments from the greatest masters of our time like Kyabje Dilgo Khyentse Rinpoche, Kyabje Penor Rinpoche, Kyabje Khenpo Ngagchung, Kyabje Khenpo Jigme Phuntsok, Kyabje Lama Achok Rinpoche, the three Khenchen masters of Namdrolling etc. Ven. Khenpo Kunsang Dechen lives in Toronto and is a reclusive practitioner. 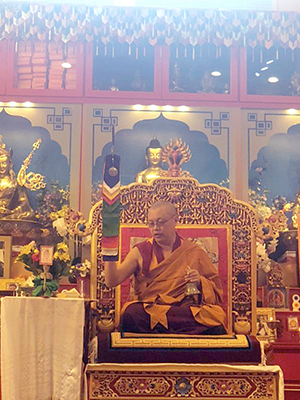 At the request of Kyabje Karma Kuchen Rinpoche during his last visit to Toronto, Ven Khenpo Kunsang Rinpoche has agreed to teach in North America in order to benefit sentient beings. We are extremely pleased he has agreed to teach and to transmit the precious lineage blessing to everyone with this opportunity to travel around and give more profound teachings that could benefit lots of sentient beings. Please help us plan and register for this event!